There were four Womble songs originally released in records and cassette. I have some info on a few of these albums, and most of the lirics. I have also added a few WAV files here and there. These are clips of the songs. The wav files are converted from PCM to MP3 which uses less space for better quality. 'Windows Sound Recorder' will be able to play these if the audio compression drivers are installed from the Windows 95/98 CD. The drivers are only 0.2mb so you don't have to worry about space. PcPlus SuperCD, issue 52B (October 1998). 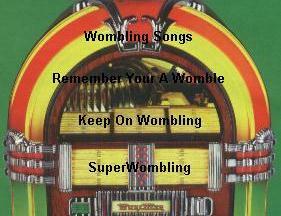 Wombling Songs, Remember Your A Womble and Keep On Wombling were available to buy boxed together. The original covers and lyric sheets were not included, but a poster, lyric/colouring book and badge were included. It was released in 1974.